The burgeoning number of abandoned poodles has created the need for interim homes until the adoption process can be completed. All poodles in our care are vetted, vaccinated, and microchipped at the minimum. 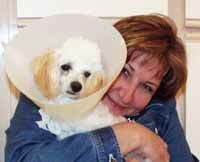 Most rescued poodles need medical care, recuperation and grooming before they can be adopted. Our generous foster volunteers keep the rescued poodles until the best possible permanent homes can be found for them. Foster care provides another important benefit: time to observe the dog and learn its personality traits. This is valuable information that Coastal Poodle Rescue uses to match the dog with a prospective owner. Interested? We can use your help! There is always an urgent need for additional foster homes. Please click the button below to fill out the foster application.